During the 18th and part of the 19th century the estate accommodated two houses. One, built as a Greenhouse in 1727, was later converted into a mansion in about 1766 and the other, a Palladian Villa built in 1735, came to be known as Whitton Place. This name was attached to both houses for periods while in separate occupation. 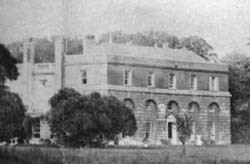 The Palladian Villa was demolished in about 1847 and the name Whitton Park thereafter defined the estate. A chronology of occupation of the houses can be viewed by going to Places/Places of Local Interest on this website. In 1625, Henry Saunders, Bailiff of the Manor of Isleworth Syon, was granted permission to enclose several parcels of land in West Field Corner on Hounslow Heath, Whitton. By 1635 the property had expanded to twelve acres and included a substantial house. He, or his son, also Henry, died in 1666 and by 1671 the property was in the hands of Richard (a Mercer of London) and Gideon Aunsham (of Southall) who had rented it out to somebody called Silver. The Aunshams were of a family recorded in the area from as early as 1475, with branches recorded in Isleworth, Heston, Hounslow and Ealing. In 1680 it had become a private estate surrounded by a paling fence and was called Whitton Park. In 1722, now 16 acres, the estate passed to Archibald Campbell, Lord Ilay, later 3rd Duke of Argyll. As a copyhold tenant of Isleworth Manor, Ilay was allowed to enclose a further ten acres of Hounslow Heath and in 1724 he began the planting of his celebrated exotic trees and shrubs. In the following year architect James Gibbs was instructed to build an aviary and a 'Green House', described in 1727 as “built of brick and finish'd with stucco without. Above this house is a dining room & his three other chambers not yet finished”. In 1732, architect and builder Roger Morris was paid for a court of offices in the eastern quarter of the park where, by 1735, a Palladian villa was built to his design. This part of the estate came to be called Whitton Place. On his death in 1761, the Duke's estate in England passed to his mistress, Mrs Elizabeth Ann Williams, with whom he had a son, William. Mrs Williams died a year later and William inherited, being also granted permission to adopt the family name of Campbell. In the spring of 1763 some of the park's finest specimen trees and shrubs were transferred to the fledgling botanical gardens at Kew. Three years later much of the Whitton estate was sold to George Gostling, a prosperous London lawyer. He converted the Greenhouse into a mansion and sold or leased the eastern quarter (known as Whitton Place) containing the Duke's villa and offices to Sir William Chambers, the architect of Somerset House and the Pagoda in Kew Gardens Chambers lived here for a while and spent a great deal of money improving the villa and filling the grounds with Italian statues and temples. In 1797 George Gostling II inherited his father's Whitton properties with the ambition to re-unite Argyll's original park within a 200 acre estate. In that year he brought in garden designer Humphrey Repton to 'de-formalise' the garden and enlarge the canal into an irregular, fish shaped lake. The Gostling family re-purchased Argyll's villa and its land and re-let it until 1847. In about 1850, Augustus Gostling demolished the villa and reunited the park where the family came to live. Towards the latter part of the century, Colonel Gostling-Murray succeeded as the last of the local landed gentry. On his death in 1892 the estate was put on the market but failed to reach its reserve price. Local residents and others pressed both the Heston and Isleworth and Twickenham Urban District Councils to save the estate as a public open space, but failed. Heston and Isleworth (now part of the London Borough of Hounslow) were preoccupied with acquiring the Treaty House estate for public offices, and Twickenham (now part of the London borough of Richmond upon Thames) in saving Marble Hill. In 1910 it was announced that the park and much of the estate had been sold for housing. 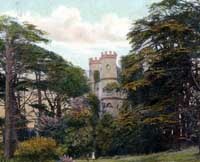 The Gothic Tower had survived, becoming known as 'Whitton Castle'. It was demolished that year, though the base remained until the 1960s. Argyll's original Green House was torn down in about 1912 and during the next few decades, the Whitton Park estate gradually disappeared under roads and housing. The Old Latymerians Association saved a sizeable piece of land in the twenties when they acquired it as a sports ground for the old boys of Latymer School, Hammersmith. A few of the famous cedars survive at its entrance and a section of the original moat can be determined. 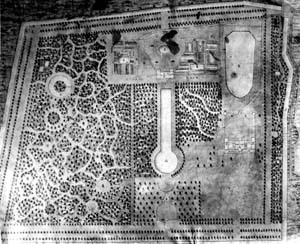 In 1928 and 1931 joint acquisition proposals for Heston and Isleworth and Twickenham councils to save the last twenty five acres were not taken up and that was the end of Whitton Park.